A giant stream of gas flowing from neighbor galaxies around our own Milky Way is much longer and older than previously thought, astronomers have discovered. The new revelations provide a fresh insight on what started the gaseous intergalactic streamer. The astronomers used the National Science Foundation’s Robert C. Byrd Green Bank Telescope (GBT) to fill important gaps in the picture of gas streaming outward from the Magellanic Clouds. The first evidence of such a flow, named the Magellanic Stream, was discovered more than 30 years ago, and subsequent observations added tantalizing suggestions that there was more. However, the earlier picture showed gaps that left unanswered whether this other gas was part of the same system. “We now have answered that question. The stream is continuous,” said David Nidever, of the University of Virginia. “We now have a much more complete map of the Magellanic Stream,” he added. The astronomers presented their findings to the American Astronomical Society’s meeting in Washington, DC. The Magellanic Clouds are the Milky Way’s two nearest neighbor galaxies, about 150,000 to 200,000 light-years distant from the Milky Way. Visible in the Southern Hemisphere, they are much smaller than our Galaxy and may have been distorted by its gravity. Nidever and his colleagues observed the Magellanic Stream for more than 100 hours with the GBT. They then combined their GBT data with that from earlier studies with other radio telescopes, including the Arecibo telescope in Puerto Rico, the Parkes telescope in Australia, and the Westerbork telescope in the Netherlands. The result shows that the stream is more than 40 percent longer than previously known with certainty. One consequence of the added length of the gas stream is that it must be older, the astronomers say. They now estimate the age of the stream at 2.5 billion years. The revised size and age of the Magellanic Stream also provides a new potential explanation for how the flow got started. “The new age of the stream puts its beginning at about the time when the two Magellanic Clouds may have passed close to each other, triggering massive bursts of star formation,” Nidever explained. “The strong stellar winds and supernova explosions from that burst of star formation could have blown out the gas and started it flowing toward the Milky Way,” he said. “This fits nicely with some of our earlier work that showed evidence for just such blowouts in the Magellanic Clouds,” said Steven Majewski, of the University of Virginia. 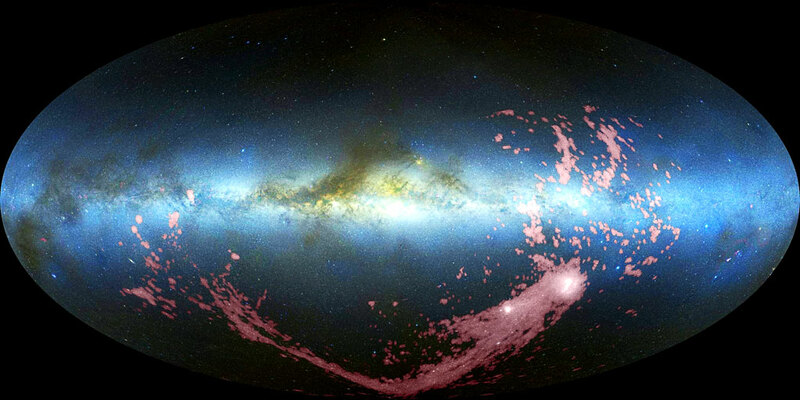 Earlier explanations for the stream’s cause required the Magellanic Clouds to pass much closer to the Milky Way, but recent orbital simulations have cast doubt on such mechanisms. Nidever and Majewski worked with Butler Burton of the Leiden Observatory and the National Radio Astronomy Observatory, and Lou Nigra of the University of Wisconsin. In addition to presenting the results to the American Astronomical Society, the scientists have submitted a paper to the Astrophysical Journal.